I've had a heap of commitments over the last few weeks that have unfortunately kept me from reviewing these beers in full. I hope you guys enjoy this write up of 7 beers I've had recently, from 6 different countries. A weekend away with family friends produced a few badges; the first being Land of the Free (Level 39). The first thing I noticed about Abita Amber was that it wasn't an Amber Ale, it was definitely a lager. Further research revealed it's a Munich Lager - it's got great fruity hops on a caramel malt base. It's a beer I'd be keen to have again. It seems everytime I write one of these Catchup posts a Hopped Up Level (or two) is unlocked. New Zealand's Kereru Resinator was the lucky beer this time (Level 22). I've never seen beers from these guys before and was suitably impressed. Resinator had really good pine characteristics as well as some tropical fruit flavours. Another running theme is that a Tru Bru Bear Club beer always seems to unlock a badge. This time Clifton Hill Brew Pub's The Dark Hill was the lucky beer. I was really pleased with this beer. It's a barrel aged version of their regular Dark Ale. As you'll read in the Bear Club post, it's roasty and lightly sour. It's a really interesting beer. Heavyweight (Level 36) is why we're talking about it. 3 Fonteinen is one of the world's leading sour brewers. If you look through the top rated Lambic's on Untappd you will find just Cantillon and 3 Fonteinen in the top 13! 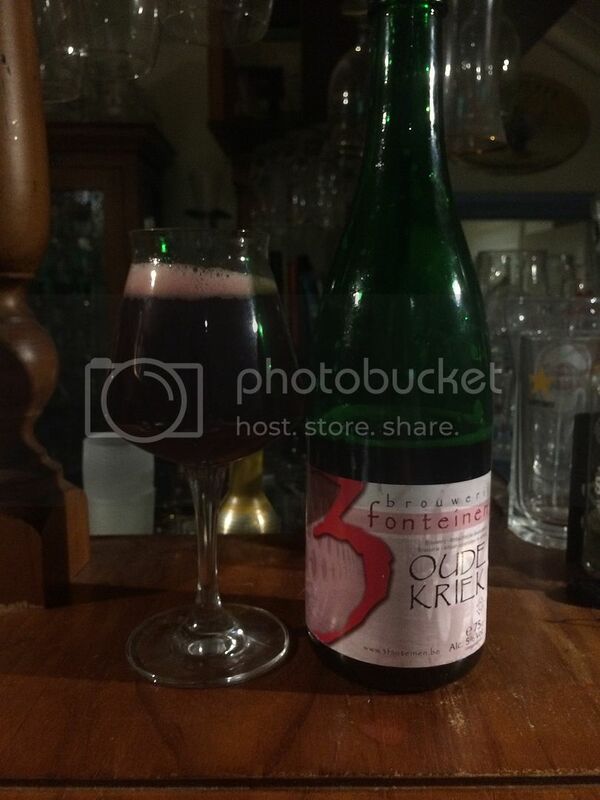 The 3 Fonteinen Oude Kriek unlocked Pucker Up (Level 24) for me. This is one of my favourite Kriek's, it doesn't have that really in your face cherry sweetness that destroy a number of the style for me. There is still some less intense cherry sweetness, but it is more sour than most. This would be my go-to Kriek, if there was such a thing. Another very highly respected brewery is De Molen from the Netherlands. I've been lucky enough to sample lots of varied stuff from these guys and their Rasputin, an Imperial Stout, is probably my favourite. I was thrilled to get to try it again in the latest Bear Club pack. It's a brilliant stout with chocolate and roast the prominent characteristics of this slightly sweet with a beautiful creamy mouthfeel. I'd highly recommend this beer to everyone, it's a ripper! Sky's the Limit (Level 12), for drinking beers above 10% ABV, is why we're here. From time to time Untappd release a badge relating to one beer or one breweries beers. Normally these are for the American-market and not possible from anyone over here to get within the date. So I was pleasantly surprised to see Adnams Ghost Ship pop up with one, a beer I just happened to have in the fridge at the time. It's a very English Pale Ale with nice, light biscuity malts paired with only mildly bitter citrus hops. It's rare these days that I get two badges in one check-in. I've recently found the beers from Kees and I've loved the two that I've tried, including this Pale Ale Citra. As the name suggests; it's an American Pale Ale which utilizes Citra hops - and importantly did it brilliantly. There was a pungent grapefruit aroma, which followed through into the taste which also included some passionfruit. I need to get more of this beer, it's going to be brilliant in summer! Witch's Brew (2015) and Going Dutch (Level 3) were the badges. So there we go guys, 8 badges, 7 beers, 7 different styles, 6 countries and 1 more Untappd Catchup post completed. One day I hope I have so much time that I won't need to do these, but until that time comes, I'm sure it won't be too long til you all see another one... As usual hit me up by email; gus.norris7@gmail.com or twitter: @Beeroclockau. Until next time!